This gift is all about creativity. It’s actually about what happens when creativity meets superb quality. I’m talking about the Melissa & Doug Easel, of course. I’m going to tell you why this is such an awesome gift idea and also how you can make it even better by adding a few accessories. 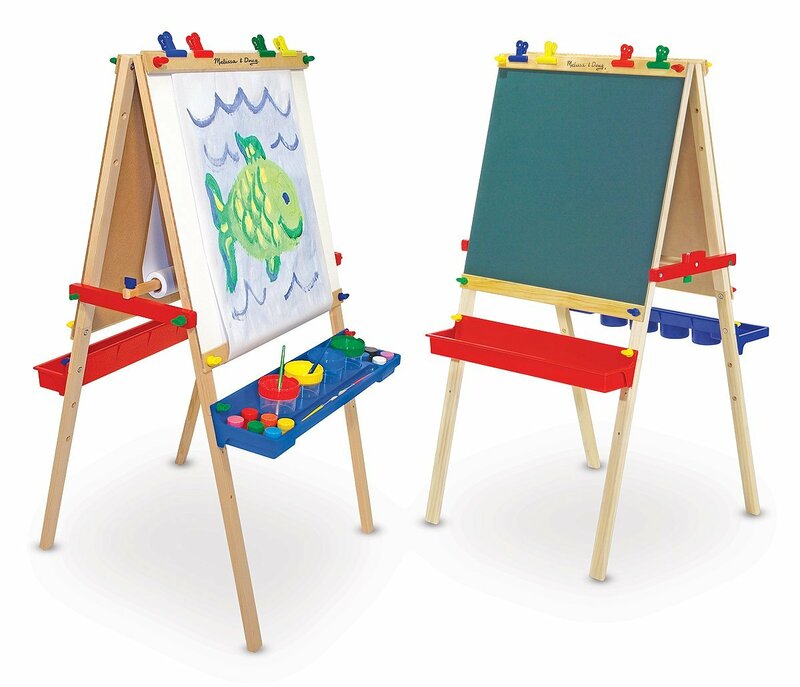 Everyone knows the Melissa & Doug brand and I’m pretty sure everyone knows the Melissa & Doug Easel too. What you may not know is just how many accessories you can get for that easel. For the perfect creative experience, you can get these items and make a complete set. It’s an awesome (and by no means cheap!) gift that will be appreciated by all – kids and their parents! Starting with the most basic item of the bundle: the easel itself. Sturdy and stable, this easel offers enough room for two aspiring artists to be working at the same time from both sides. It’s easy to assemble and easy to store. You can also easily take apart the trays to be washed in the sink after each use. With this deluxe model, you don’t necessarily need paper! One side has a dry-erase board and the other has a chalkboard, allowing kids to experiment with chalks and markers. When you want the kiddos to use paint, just put a roll of quality paper in this Melissa & Doug Easel and let them play Picasso! 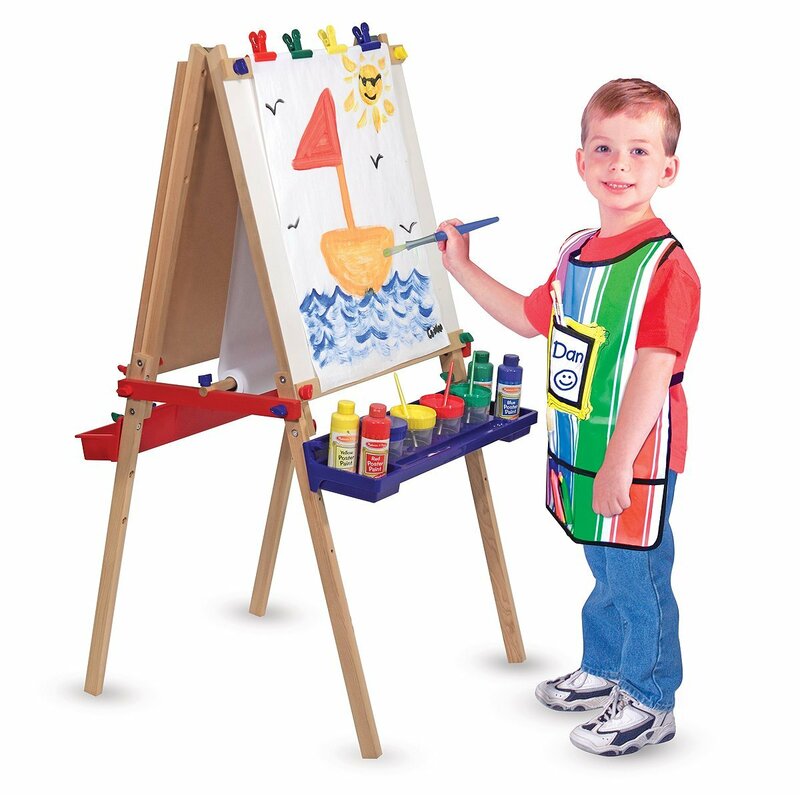 When you buy this item, you get the double-sided easel. Now is the time to add a few accessories! Gotta have something to paint with, right? 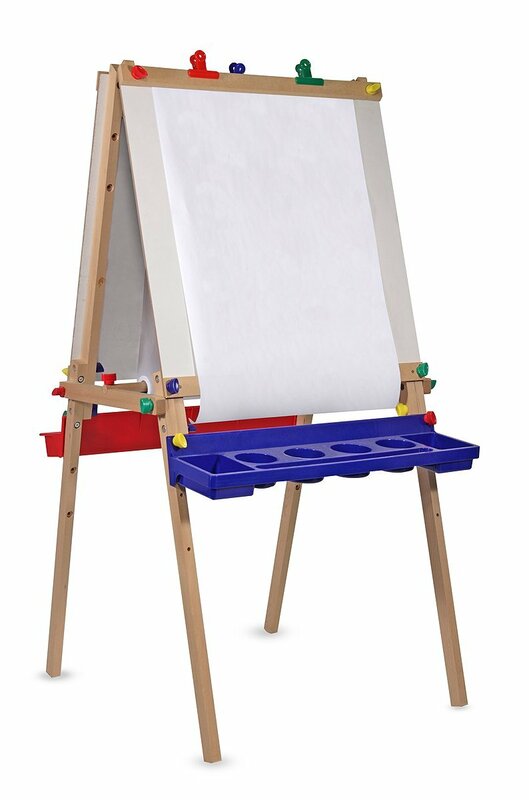 This awesome set gets you everything you need to turn your Melissa & Doug Easel into a state-of-the-art art station. 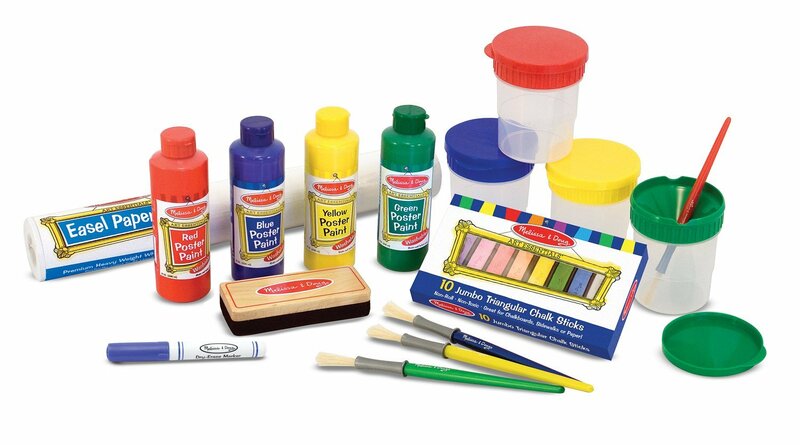 This set includes 4 bottles of poster paint, 4 paint cups, 4 brushes, a paper roll, colorful chalks, dry-erase markers and an eraser. So many options to choose from! Let your kid experiment with various types and styles with this perfect set. Check it out on Amazon now. And don’t forget the environment! At least the kids’ immediate environment. 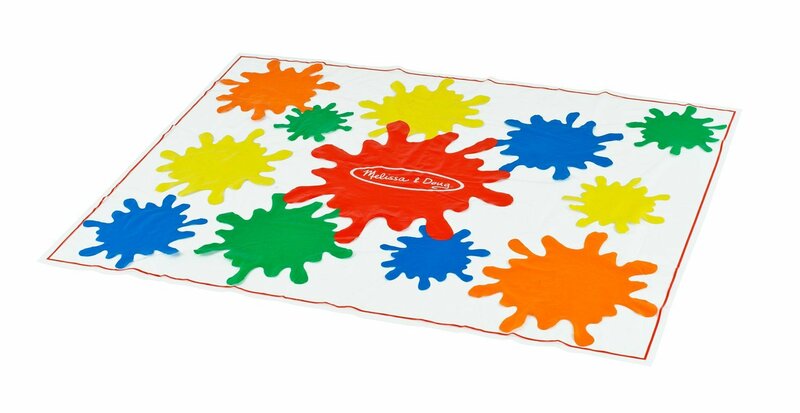 Protect the floor by spreading this splotch-rug, aka the drop cloth, under the Melissa & Doug easel. There you have it! The perfect set for kids that the parents are going to love too! You can order all of them together, or just stick to the Melissa & Doug easel itself. It’s entirely up to you. 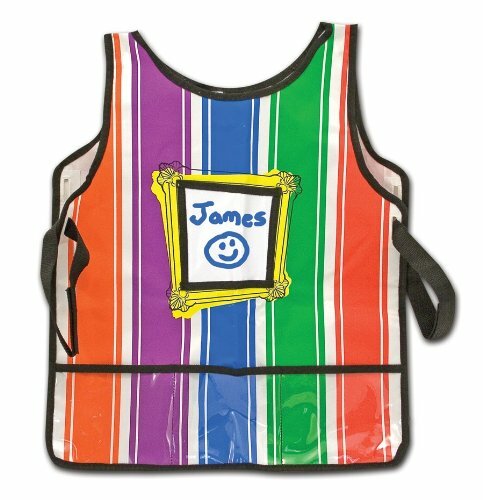 Amazon offers the easel, paints and smock as a package here but you can also shop for each item separately. What do you think? Have you tried the Doug & Melissa easel? Have you tried any of their other products? Let me know in the comments section below!